Graphic novels are a very important activity for the publishing industry in France, more than in other countries. I’m not a great reader, but I was stunned by the 320 pages of ” The Art of Charlie Chan Hock Chye ” (1) by Sonny Liew from Singapore, published by Epigram in 2015 and by Pantheon Books (1) in the United States in 2016. This book won three Eisner Awards in 2017, the “Nobel” prizes for graphic novels, even if the awards are very focused on American authors. We are told the life of Charlie Chan, an imaginary author of comics, but who over the pages, becomes a credible character and not just the spokesman of Sonny Liew. The book begins during the colonial period, in 1948, when Charlie Chan was ten years old. His life will be intimately intertwined with many episodes of Singapore’s history. Most of the chapters are done in different graphic styles and are often tributes to big names from the graphic novels of the past like Osamu Tezuka and his Astro Boy, Walt Kelly and Frank Miller … The layout is superb, very varied, very inventive; it is necessary to seduce the reader so that he reads with passion the 320 pages of the book. The author explains that he is irritated by the will of the authorities to establish a kind of official history especially around Lee Kuan Yew who was prime minister until 1990 and for 31 years, then of his family (his son being the current Prime Minister). Indeed “the mountain cannot accommodate two tigers”, but the book reminds us that there was a second tiger who is now forgotten, Lim Chin Siong. These two characters are staged in several episodes of Singapore’s history that Jeremy Tiang told us in his novel “State of emergency”. The book’s notes explain the events of the various chapters and provide interesting bibliographical references that remind us that the history of Singapore is not the quiet long river of a remarkable economic development but years of noise and fury, political and social conflicts, difficult relations with Malaysia and Indonesia. Lim Chin Siong was one of the top trade union leaders of the 1950s and, along with Lee Kuan Yew, one of the founders of the People’s Action Party (PAP). The PAP won the 1959 elections, which allowed Lim to be released after three years in prison. In 1961, the left wing of the PAP, led by Lim, provoked a split and created the Barisan Socialis party. The aim of Operation Coldstore, in 1963, was to arrest many of the opposition leaders. 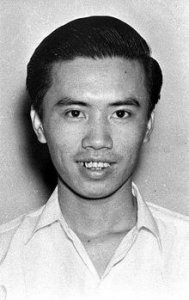 Lim, described as a Communist, will only be released in 1969 and exiled to London after promising to stop all political activities. He sells fruits and vegetables and does not return to Singapore before 1984 where he remains until his death in 1996. The book also tells us about the union with Malaysia in 1963 and the separation in August 1965 and what was called the Marxist Conspiracy (Operation Spectrum in 1987). In the book, Lee Kuan Yew is certainly not the unique hero in Singapore’s history even though he is a fundamental actor, presented as brilliant, devious and unscrupulous. Sonny Liew was born in Malaysia in 1974, in Seremban. At the age of five he went to Singapore where he attended high school and then philosophy at Cambridge. A passion for graphic novels, he began publishing in 1996 and followed courses at the Rhode Island School of Design in 2001. He worked in Boston for a video game company but preferred to return to Singapore and publish graphic novels, what he has been doing with growing success. The book, published by Epigram Books in 2015, was selling well, the NAC decision is an unexpected advertising campaign, 15,000 copies are sold in a few months! An American edition is released and the book translated into French (2) and Spanish. NAC’s decision revives the debate on censorship in Singapore, but it should not be forgotten that Sonny Liew won the Singapore Literature Award, participated in festivals organized by the authorities that subsidize his studio and did not limit his collaboration with the local media. There is certainly a very strict control but it is far from the situation we know in China where some writers “invited to drink tea” by the police are wondering if they will be able to return home! 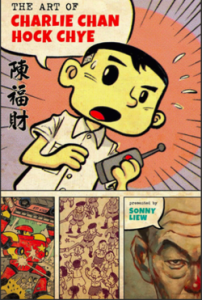 (1) Sonny Liew, “The Art of Charlie Chan Hock. Pantheon Books, 2016. (2) Sonny Liew, “Charlie Chan Hock Chye, une vie dessinée », traduit par Françoise Effose-Roche. Urban Comics 2017, 320 pages, 22,50 euros.